I promised Maxine I'd read this book tonight. It's very long and there's a double episode of The Hills on. I just watched this movie again the other day and oh my god. I was going to go to Forever 21 to see if I could pick up some knock-off funny accessories to wear with my Bernhard tomorrow, but I'm too tired, so I'll stay home, order dinner, and watch The Hills instead. I think my favorite publicist in New York, Kelly Cutrone, is on the show tonight. I've never been much for special occasion dressing -- to be honest, one of the biggest reasons I didn't go to my senior prom was because I honestly could not be bothered to find a dress. And, lucky for me (maybe not for my friends), most of my friends have not yet gotten hitched, so I've been lucky enough to skirt the wedding-guest-dress-buying experience. One of my best friends from high school got married last fall and I think I wore something totally inappropriate and too short... (sorry, d). Anyway, between Saturday's baby party, on which the invitation read "creative red dress" and tomorrow's dinner and dancing for DIFFA, I've had kind of a whirlwind week of desperately trying to find something appropriate to wear. It is harder than I thought. Between the very particular dress codes, my very specific ideas on what I want to wear, and the state of the dollar v euro, it's been murder trying to find something really great for not a lot of money. For tomorrow's benefit I was really nervous that I wouldn't be able to find something for under $1000. In the end, my Bernhard dress was totally affordable and isn't all that fancy (it's made of black jersey), but it's pretty out there, silhouette-wise, and I've got some great shiny leggings to go with it, so i think it will be weird enough. Yeah, that's what it's come down to -- if you can't beat 'em, weird 'em out. On (lazy) Sunday I took myself up to the Met to see Diane Pernet, one of my favorite fashion people ever, The Times' fashion critic Cathy Horyn, Sartorialist Scott Schuman, and Costume Institute curator Harold Koda give a panel talk on fashion blogging in conjunction with the current Costume Institute Exhibit blog.mode. They're each from different professional/publishing backgrounds -- Diane was formerly a designer, the fashion editor of Joyce magazine, a videographer, and currently also the co-editor-in-chief of Zoo Magazine; Cathy is the fashion critic at the New York Times, probably one of the most widely read English language fashion critics; and Scott formerly worked in the fashion industry. Each of them are tastemakers. Each of them have a loyal fan following (though, before the show, Diane received the most cheek-kisses and visitors). They raised some interesting points about the business (and art) of fashion blogging. Notes on Diane Pernet: She remarked that her blog is "not about me, but what I like and what I find interesting." She has an army of about 15 contributors scattered all over the world, including locations like Mumbai and Kuwait. She pays a lot of attention to designers when they're still in school, and is especially interested in work coming out the Royal Academy in Antwerp. Her latest film project You Wear it Well screens tonight at the Tribeca Grand. Notes on Cathy Horyn: Idea of the blog came to her while watching the Emmys in 2006 -- she saw the original Charlies' Angels on stage and thought that there was something she could say about them, but not for a full print article. While the Times is an enormous corporation, broadsheet writers are, by and large, autonomous. Her blog began in Jauary 2007 after a Paris fashion week cafe argument where she asserted that, "A blog can be anything today." The blog allows her to expand on a show -- to engage in a dialogue where it's possible to return to the subject of a show. There's not as much freedom in print. "It's better to do certain things on the blog because of the way journalism has shifted." It's a challenge to let the blog be what it will be. She reads every post that comes in. She has "different voices" for the magazine, the broadsheet, and the blog. She perceives that the blog is a way to address the challenges of contemporary journalism -- to engage readers and adapt to new media. She likes that, on her blog, it's just accepted fact that fashion is important. The panelists all agreed that one of the most important factors contributing to the success of a blog is the singular voice. I guess it's not so different than a magazine -- good magazines are good magazines mostly because they have a point of view. Cathy talked about how the world of journalism is changing, and, more specifically, the newspaper world is changing. What the fashion news world needs is "not a more assertive fashion critic," Horyn says, but someone who is a journalist -- "Learn how to be an investigative reporter," she says. "Learn how to read a balance sheet." Horyn discussed the need for a different type of information about clothes. She admires Kennedy Fraser's work at the New Yorker. Speaking of the work of designers such as Alaia or Nicolas Ghesquiere for Balenciaga, Horyn says, "Shouldn't the caliber of crtiticism beat that level?" An audience asks whether blogging in an exercise in self-indulgence / self-importance. Harold Koda remarks that "by nature of the blog, bloggers are opening themselves up for critique." After two years, I finally got myself a toaster. I love this book, I can't stop reading it, it's trashy teen fiction at its very best. "I think it was me, it must have been me, I guess I did something wrong. I tried too hard, I wanted too much, I guess that's why he's gone. I lost my pride, I fought and cried, I felt like a little kid. What's wrong with me, I still can't believe I did the things I did. I couldn't change him, he was gonna break my heart. I saw it coming, yeah, I knew it from the start." Stopped by Seven New York and got my Bernhard Willhelm dress for Tuesday's DIFFA dinner. Also picked up a new HenrikVibskov scarf. Hurrah! Audience question: "Where is Zandra Rhodes?" Diane: "What do you mean, 'Where is Zandra Rhodes?'" Why are all fashion events preceded by absurd, unnecessary queues? Holy crap. Suggested admission to the Met is now $20 for adults. When I was in HS it was only $10, which was still a lot. I think I have some mild kind of social anxiety disorder. Every time I go uptown I get clammy hands and heart palpitations. When I was in high school my friend told me a story about a boy in our class who was banned from this toy store when he was eight years old. The fashion world is actually a really small one. Ok, Alisa so is right, they're really loud and tacky, but I can't help but loooove and compulsively buy Sky dresses and tops -- check out the tigers on my newest acquisition. I've been invited to attend a baby's 100th-day celebration tomorrow and I'm super-excited! I've never been to a baby party before (probably because so few of my close friends are married, much less have children). I bought a red frock to wear and got some posh baby things to bring. "I think if I'm going to have a boyfriend who works out, he better be sort of embarrassed about it.... Sheepish fitness is the only tolerable kind." - Mindy K, from The Office, who used to live across the hall from Helen at Dartmouth. Chinese fat camp: Soy milk and steamed bread, yum! Pet Shop Boys - "I'm With Stupid"
Coinciding with the release of Wong Kar Wai's film, My Blueberry Nights, Opening Ceremony has created a limited-edition run of T-shirts, postcards, and posters featuring original scouting photographs taken by the legendary director while searching for filming locations. T-shirts, $95; postcard set, $25; posters, $50; all available exclusively at Opening Ceremony's New York and Los Angeles locations. Dinner with the girls tonight; we're all in spring limbo -- Springbo. Hoping things get more settled by the summertime; am convinced our loopy-loopiness all has to do with global warming. Sharon's just back from Mexico. Susan's just moved to new digs. Belinda's ditching us for Nashville. And me, I'm just wrapping my head around my fourth year back in New York when I never intended to live my adult life here to start with. Ah, but the exchange rate. London will just have to wait. Actually, for me, it's all about the waterside house in Oxford these days -- I'm desperate to move to a small town, live by the water, write at home and sit around in the grass playing with puppies all day long. I'm just gasping for some fresh air. And what about the summer? Europe's too expensive right now. America's like the new USSR; we're, like, the Mexico of Europe. Thank god T&C are coming to New York in June, at least I'll get to see them then. I wish they'd come for longer, we could travel. Nashville, LA. Come on guys. Susie wants to go to S. Korea to try to become a pop star; I keep telling her we're too old and I'm not anywhere near thin enough. In the meantime I'm trying to figure out why the top teen bestsellers on Amazon.com are all vampire books. S: "I didn't play hard to get, I'm just retarded." 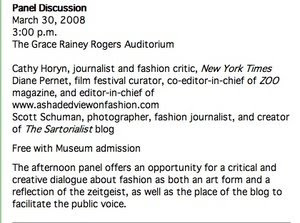 Two of my favorite fashion people on a fashion blogging panel this Sunday at the Met. I love how downtown doesn't wake up before noon. Jermaine Jackson named one of his children Jermajesty. Look what people can do with Peeps! My friend Jen sent this to me. She's on a bus with wireless (!!!) on the way to DC. Hi Jen! Know me, know my obsession with Maybelline's Wet Shine Diamonds Liquid lip gloss in "Pink Diamonds." With all the cool products I get to test out day after day, this is the one gloss I keep going back to in my personal, daily life -- over the past few years I've bought dozens and dozens of tubes. Unfortunately, since Maybelline decided to phase out and discontinue this product last year, I've resorted to the internet to buy up cases of it. Today, I just picked up 23 tubes, the last bit of stock from buymebeauty.com. Ack. I know lots of people have experienced the panic of discontinuation -- most of the stories I've heard are about high-end color cosmetics and fragrances that are now only available in niche European markets. Anyway, I guess it's my turn to panic. I can't believe I just spent $137 on Maybelline lip gloss, but really it's that good. And definitely the most photogenic lip gloss out there, hands down. I can't believe garbage trucks are allowed to collect trash at this hour on residential blocks -- they are so loud and have lots of flashing light. My alarm is going to go off in about two hours. Terrible insomnia lately. Like now, 3 a.m., mind going 150 mph, can't shut down. Am really starting to feel my age. Stress has never really affected me like this before, not in the way it's ruled my life in the last two or three years. Evergreen's new mugs have ads all over them! If I don't constantly have information at my fingertips, I freak out. I'm obsessed with Viigo. See above. A 20 minute hot bath before bed means the difference between tossing and turning for an hour and a half and drifting off to sleep in ten minutes. People who talk about weight loss all the time are so boring. I am really really sick of adding up all my 2007 receipts. This tax system is bunk. So is our health care system. I love Danity Kane and their big big hair. Nokia phones and Blackberries are my favorite. Tomorrow morning I am going to the Sean John store to buy a "NO BITCHASSNESS" shirt because I want to be like Diddy. Add squid to the list of things I am allergic to, which heretofore included scallops and penicillin. 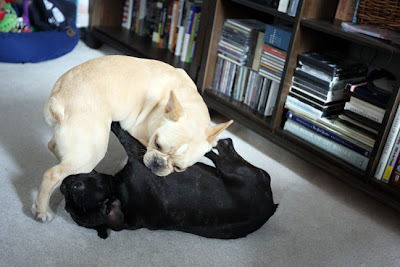 I really liked Julia Allison's blog, I wish she'd get back to it. "I've seen more hair on you than, I didn't even know they sold that much hair." - about Aubrey. Chocolate? Said the waiter. Yes please! Said Jen. Oh. My. God. So you can be allergic to exercise! This is so me. SlateNYC: Unfashionably, unfathomably bad service. Since moving downtown in 2005, I've paid my local laundromat to do my laundry -- I'd estimate I spend about $60 a month. In two years of using the same service, they never lost anything -- not even a sock. But in recent months, they've "lost" several expensive casual pieces -- brands like Juicy Couture -- and, despite leaving various notes, my phone numbers, and information on how to contact me, no one's even bothered to call. (1) I signed up on February 11th. (2) They charged my credit card $69 on February 13th. (3) Their online scheduling system doesn't work so I call once. No one is there, so I leave a message. (4) No one returns my call so two days later I call again, leave another message. (5) No one returns my call so two days later I call again, leave a third message. (6) No one returns my call so two days later I call again, finally get a woman on the phone. She takes my name, number and address and says she will call me back in the afternoon. (7) She never calls me back, so I call back the next day and speak to a man, who sets up my first pick-up for Monday, February 25th. He tells me I am all set for bi-monthly pick-ups every other Monday at the same time. (8) They pick up my laundry on February 25th and return it on February 27th. (9) This past Monday, March 10th, I left my laundry with my doorman for Slate to pick up. (10) Slate charges me $69 for my second month. (11) I discover today that they never picked up my laundry on Monday. (12) I phoned and left a message. You think someone will call me back? 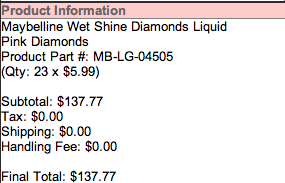 So far I have paid Slate $138 to do ONE bag of laundry. Slate NYC laundry is the worst service I have ever signed up for. And if I ever get anyone there on the phone I am going to cancel my service and demand a refund. I am actually really shocked that no one has ever written anything but blind praise about their service before -- I know I've been offered their services on a free-trial basis by publicists several times over. Silly me, I decided to sign up independently and pay out of my own pocket. Maybe Slate is one of those companies that takes better care of you when they know you're press. Tonight I met Laura Kohler at a Kohler party. And there is a showerhead in the gift bag. Every time I get around corporate types I can't control myself. It's like I get horrible socially inappropriate verbal diarrhea and I have to say shocking obnoxious things to them to shake them up. It's like a reflex. It's like I get provoked by perky canned conversation and small talk and I just can't stop. I'd make a terrible socialite. Seen this a lot recently, men carrying their ladies purses walking down the street.